EATEN continues to tour in 2019!! 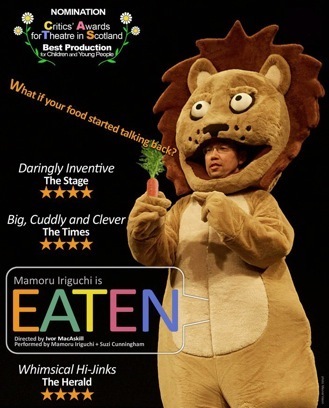 Originally trained as a zoologist, then as a theatre designer, Mamoru is also a performance maker based in Edinburgh, Scotland. The performance works are rooted in his knowledge and experience in designing set, costume and projection as well as his interests in 2D and 3D, liveness and pre-recorded-ness, gender and sexuality, fairytales and evolution theories. All his full-length pieces toured in the UK and internationally to countries including Germany, Turkey, Italy, Spain, Ireland, Portugal, Sweden, Denmark, Switzerland and the USA. His theatre design work include Mincemeat (Cardboard Citizens, Best Design, Evening Standard Theatre Awards)and The Pink Bits (Mapping4D, Oxford Samuel Beckett Theatre Award). Mamoru worked as graphic designer for Brain’s various projects including Carpe Minuta Prima, Purge and his DVD published by Live Art Development Agency. Mamoru regularly performs for Cruising for Art that Brian curates. Susanne is a preformance maker, director and dramaturg based in Frankfurt. She is working with Mamoru also as dramaturg on his new projects. Mamoru was invited to work with Eilidh on her new performance piece about gender in children’s theatre. Their first outing was at Southbank Centre, London, July 2016. A choreographic piece that was premiered in autumn 2013 as part of Dance Umbrella. It is currently touring nationally. Choreographical projects. Other collaborators: Gerrard Bell, Antje Hildebrandt, Tim Jeeves, Elena Koukoli, Taylan Halici, Neil Callaghan, Helka Kaski, Lucille Acevedo-Jones, Duncun McLeod. Mamoru is to lead Weekender Lab @ Artsadmin on 9 & 10 March! click here for more info! EATEN programmed for Intenational Theater Festival for Children and Youth 2019 in Bethlehem and Ramallah! This tour has been made possible thanks to Creative Scotland Onward Touring Fund. Independent Art Projects awarded with Creative Scotland’s new Touring Fund to tour Eaten this autumn! EATEN included in Puppet Animation Festival in April 2019! EATEN is nominated for CATS (Critics’ Awards for Theatre in Scotland)! click here for more info! Tate Kids video “How to be a Performance Artist” is now online. click here to view it!